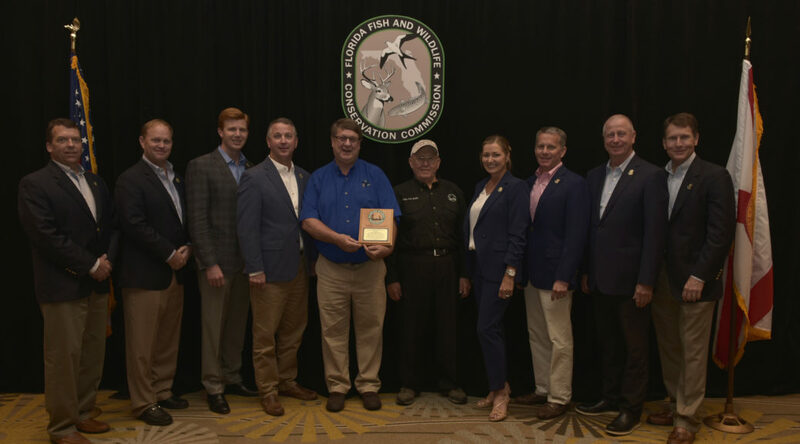 FWC biologist John Hunt has received the Capt. Phil Chapman Award, presented to him by the FGA for those who display a passionate commitment to the conservation of Florida’s marine fisheries. Congratulations, John! 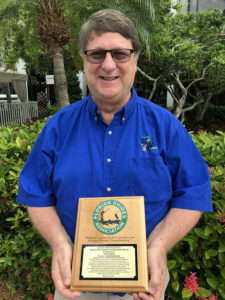 John has been at the forefront of marine fisheries research efforts in the Florida Keys for nearly 30 years, and has been instrumental in numerous conservation and scientific efforts aimed at ensuring these fragile ecosystems endure for generations to come. John Hunt seen here with his Captain Phil Chapman Conservation Award. John is a world-renowned lobster biologist. His contributions to conservation include research and monitoring work for the multimillion-dollar Caribbean spiny lobster fishery in Florida, additions to the body of science on reef fish ecology and conservation – particularly regarding the effectiveness of marine protected areas – and leadership for the establishment of the Florida Keys National Marine Sanctuary, the Tortugas Ecological Reserve and the recently established Tortugas Research Natural Area. The FGA also awarded FWC officer Michael Bibeau of Hillsborough County with the “Trained Eyes Coast Watchers” Officer of the Year Award. 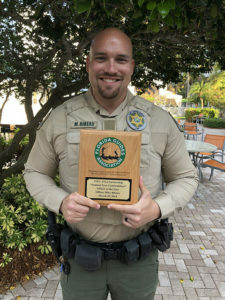 Bibeau patrols his home county of Pinellas where he maintains strong working relationships with local partner agencies in enforcing conservation rules and regulations, promoting education and conservation stewardship among those enjoying Florida’s natural resources. Officer Bibeau posing with his Trained-Eyes Coast Watcher Officer of the Year Award. Officer Bibeau’s actions set an example whose reach is felt statewide through his leadership as a Field Training Officer and on FWC’s Special Operations Group and Advanced Conservation Training Academy as well as participating in the Great American Teach-In program. Congratulations, Michael!